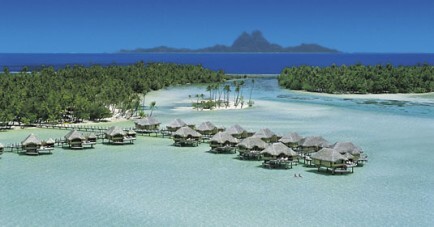 Beach Villas or Overwater Bungalows. Le Taha'a Private Island and Spa is 5 minutes by boat from the main island of Taha'a and 35 min by boat from Raiatea Island . Major airlines fly into Papeete, the capital of Tahiti, and then a domestic flight must be taken to Raiatea. Le Tahaa is the ultimate luxury and exclusive hideaway of glistening beaches and sparkling waters in the South Pacific. Located on Motu Tautau just off the island of Tahaa in the Society Islands Archipelago, is the beautiful getaway and Spa that also offers magnificent views of Bora Bora. The island of Tahaa is also known as the vanilla island - as soon as you arrive you will smell the fresh vanilla in the air! In the fertile valleys, local farmers grow watermelon, vanilla, and copra. The public areas at this luxury resort are built in the trees, providing an exquisite view of the lagoon and Taha'a Island. For your luxury accommodation you can choose a Beach Villa or a variety of over water bungalows (for more details please refer to side menu). There are three restaurants and two bars. La Plage is located by the pool and beachside. Vanille and Ohiri are located in the heart of the resort among the trees. Vanille is the main restaurant and Ohiri is for fine dining. Enjoy beach barbecues and Polynesian and seafood buffets accompanied with live entertainment. Le Tahaa has a beautiful fresh water swimming pool which is next to the beach and surrounded by decked and tiled areas with lounge chairs. It is serviced throughout the day by a pool bar and restaurant "La Plage". Other activities include jet skis, water skis, a night lit tennis court. Petanque, voleyball court, beach spa pool. Other activities that can be arranged include scuba diving, 4x4 excursions to vanilla plantations and black pearl farms.